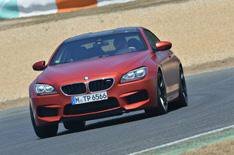 2013 BMW M6 Competition Pack review | What Car? The BMW M6 Competition Package is an even faster and more focused version of BMW's 6 Series-based performance car. Power rises by 15bhp to 576bhp. Maximum torque is unchanged, but it's available across a wider rev range. These improvements shave a tenth of a second off the 0-62mph time, cutting it to 4.2 seconds in the Convertible and 4.1 in the Coupe and Gran Coupe. More significantly, the new Competition Package brings lowered and stiffened suspension, sharper steering, bespoke 20-inch alloys and a new sports exhaust. BMW has also tweaked the differential to allow more slip before the stability control kicks in. A similarly specified Competition Package version of the BMW M5 is also available. What's the 2013 BMW M6 Competition Pack like to drive? We tried the Coupe model on track, but without driving it back-to-back with a regular M6, any improvements were difficult to spot. Like the regular M6, the Competition Package model feels very agile for a car that weighs the best part of two tonnes, but it still isn't as alert or involving a Porsche 911, and the steering remains a little remote. The benefits of the extra power are just as subtle, because the M6 has always felt ferociously fast. In fact, much of the time this Competition Package car struggles to get all of its power to the road cleanly. Even when the stability control system is in its more relaxed Dynamic mode it can be a little intrusive, and while you can switch it off, you'll then have to be careful with your throttle inputs to avoid spinning up the rear wheels. The twin-clutch gearbox is harder to fault, delivering smooth shifts in full auto mode and super-fast gearchanges when you select one of the more aggressive settings. Our car was also fitted with optional carbon-ceramic brakes, which continue to feel strong when you work them hard for an extended period. Try the same with the standard steel brakes and they'll soon start to fade. What's the 2013 BMW M6 Competition Pack like inside? There are no changes here, so you get carbonfibre trim, an elegant sports steering wheel and a cluster of buttons that allow you to quickly adjust the suspension, steering weight and gearshift speed. True, most of the other fittings are shared with much cheaper versions of the 6 Series, but this does mean you get the company's intuitive iDrive infotainment system. There's plenty of space in the front, too, and the standard sports seats are hugely adjustable. However, anyone approaching six-feet tall is likely to be uncomfortable in the back. The M6 has always been an expensive car, and this Competition Package adds an extra 6500 to the price, pushing it beyond 100,000. Considering that you'll struggle to spot the changes, you'd be better off putting the money towards carbon-ceramic brakes for the regular M6. Alternatively, for thousands less you could have the superior if less practical Porsche 911.